If you’ve always wanted a KitchenAid Mixer today is your day!! 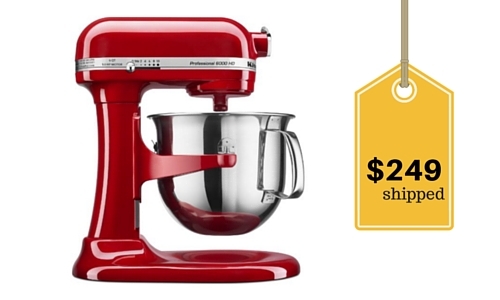 Get a Kitchen Aid 6 qt professional mixer for $248.99 shipped (reg. $350)! This is the biggest and swankiest Kitchen Aid they make and is the price of the much smaller Artisan mixer today only. This Professional 6000 HD Series stand mixer has a quiet and robust DC motor and a large capacity that easily mixes recipes with up to 14 cups flour, 13 dozen cookies or knead dough for 8 1/4 loaves of bread in a single bowl. If you pay with Amazon Rewards credit card, use code VISA30 at checkout and you’ll get another $30 off!! This offer is for Amazon Prime Members only. If you aren’t a prime member you can sign up for the free 30 day trial and get to shop all the deals today.